The Shenandoah Valley was known as the Breadbasket of the Confederacy during the Civil War and seen as a back door for Confederate raids on Maryland, Washington and Pennsylvania. Because of its strategic importance it was the scene of three major campaigns. 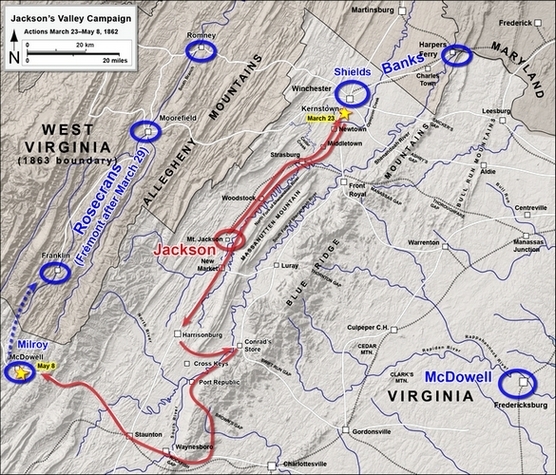 The first was the Valley Campaign of 1862, in which Confederate General Stonewall Jackson successfully defended the valley against three numerically superior Union armies. 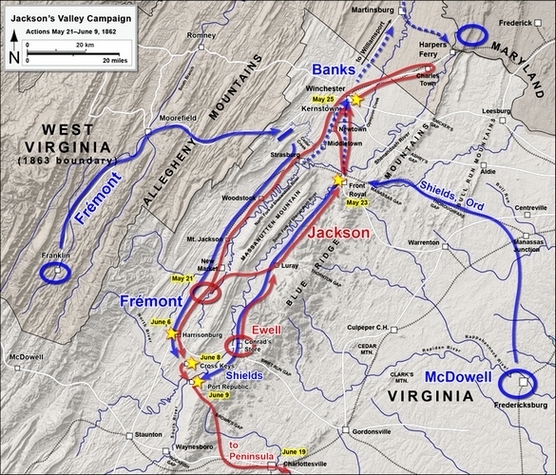 The final two were the Valley Campaigns of 1864. First, in the summer of 1864, Confederate General Jubal Early cleared the valley of its Union occupiers and then proceeded to raid Maryland, Pennsylvania and D.C. Then during the Autumn, Union General Philip Sheridan was sent to drive Early from the valley and once-and-for-all destroy its use to the Confederates by putting it to the torch using scorched-earth tactics. The valley, especially in the lower northern section, was also the scene of bitter partisan fighting as the region's inhabitants were deeply divided over loyalties, and Confederate partisans, such as John Mosby and his Rangers, frequently operated in the area. The Shenandoah Valley was a vital asset to the Confederacy from the beginning of the Civil War. In a human sense, the Valley became invaluable in its ability to feed soldiers in the field. Militarily, the Valley gave the South a unique geographical advantage in the Eastern Theater. Because a Confederate force moving down the Valley would be marching northeast, the Valley could conveniently deposit an army not far west of the U.S. capitol in Washington. On the other hand, United States forces in the Valley making a move southward would be taken away from the Confederate capital in Richmond due to its southwest physicality. Another advantage afforded Confederate forces in the Valley was the cover it provided. The mountains fronted an effective shield which concealed the Southerners from prying Yankee eyes. Such secrecy was amply demonstrated in Jubal Early's raid on the defenses of Washington in 1864. He nearly made it to the capital before U.S. Grant even knew he was coming. Early in the war, Thomas J. 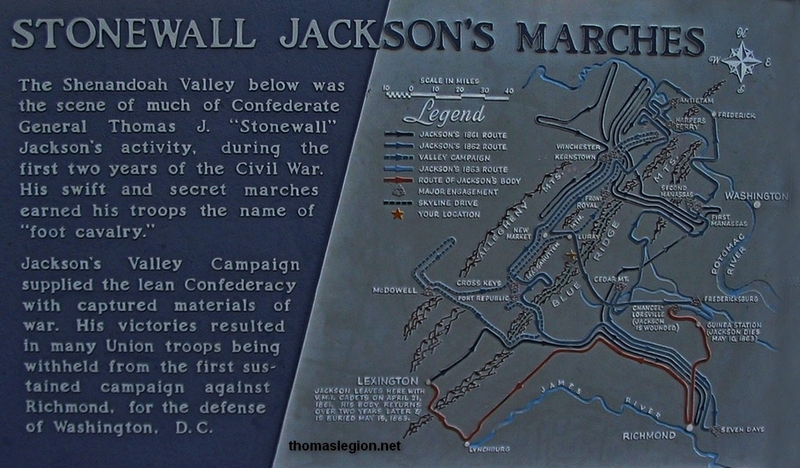 "Stonewall" Jackson, formerly a professor at Lexington's Virginia Military Institute, used his famous "foot cavalry" and his mens' knowledge of the area to become master of the Valley. Because the Valley was in parts split by intervening mountains as was the area just north of Port Republic to Strasburg, a numerically inferior army could manage to "plug up" the gaps in the Valley and prevent offensive movement by the United States. Using this advantage to the fullest, as well as taking advantage of extensive knowledge of the area, aided in part by Augusta County's Jedediah Hotchkiss "The Mapmaker of the Confederacy", Stonewall managed to keep the United States forces from penetrating too far down the valley without a swift rebuttal. Idolized throughout the Valley, this deeply religious man came to be seen as its inhabitants' protector. The Shenandoah suffered a blow at the Battle of Chancellorsville, May 2, 1863. As dusk fell on the battlefield, Stonewall Jackson was mistakenly shot down by a regiment from North Carolina. He died seven days later. In 1864 the Valley once again became the target of protracted invasion by the United States. In the spring, Major General Franz Sigel took command of the Department of West Virginia. 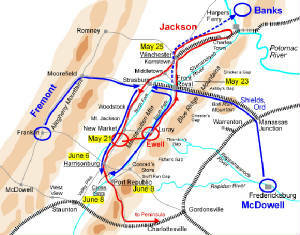 On April 29, Sigel headed up the Valley, with the plan to fight his way to Staunton. He was to meet there with Union forces under Brigadier General George Crook. Crook's orders were to leave headquarters in West Virginia and assault the Virginia & Tennessee Railroad at the New River Bridge located between Christiansburg and Dublin. Meanwhile, Brigadier General William Averell was to take command of Crook's cavalry and assault the Confederate salt mine at Saltville. After their objectives were met, the two generals were to meet with Sigel in Staunton to destroy the Virginia Central Railroad. In response, Major General John Breckinridge, formerly Vice President of the United States under Buchanan, did his best in splitting up his undersized army to meet this triple threat. A part of Breckinridge's force moved to protect Saltville. General Averell heard false reports of an overly-formidable force there and decided to try Wytheville instead. The Confederates moved there quicker than he did and repulsed him in a trouncing on May 8. Their comrades guarding Dublin from Crook's forces encountered them on the ninth and were finally driven back after repeated charges, including several led by future U.S. President Rutherford B. Hayes. 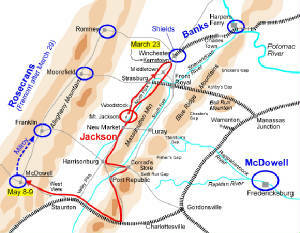 The United States forces reached their objective the next day and burned the New River Bridge, despite an artillery barrage from Colonel John McCausland. Interestingly, Crook then gathered up his forces and retreated west, saying later that he captured a Confederate dispatch that said Lee had defeated Grant at the Battle of the Wilderness. Crook feared being cut off by a portion of Lee's army. Crook and Averell made the long march back to West Virginia. General Sigel was making a very slow march up the Valley, much to the benefit of Breckinridge's scattered forces. He heard various rumors of Confederate forces all around him, and the "McClellan-esque" general accordingly took his time, cautiously moving south. General Breckinridge organized at Staunton, and on the 13th of May headed north with his forces, including the VMI Corps of Cadets. On May 15th, Breckinridge's forces defeated Sigel at the Battle of New Market, which included the famed charge by the Corps. 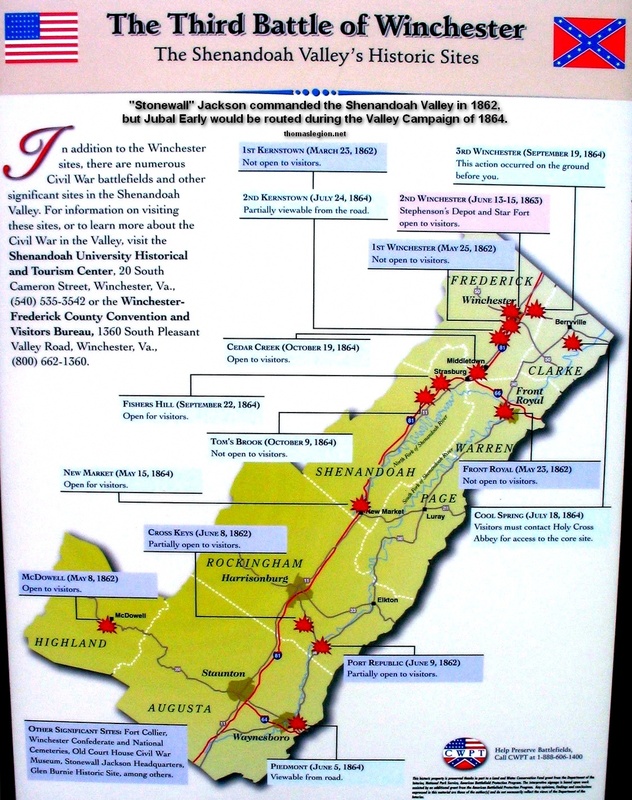 Saving the Shenandoah on the anniversary of Stonewall's funeral, Breckinridge was being hailed as the "new Jackson", the Valley's new guardian. General Lee wasted no time in recalling Breckinridge to help him fight Grant in the east. This seemed sound practice because of the fact that in previous campaigns, a Confederate victory left the U.S. forces confused and inable to act for many months. The difference this time was that U.S. Grant was in charge. If anything, Grant was known for his nose down, no-nonsense, continuous attacks, and the Valley would soon find out that he had no intention of letting up. On May 26, the new U.S. commander, David Hunter, moved up the Valley, burning houses as he went, despite Grant's order to only take things which were necessary for his troops. On the 30th, he reached the New Market battlefield, only 15 days after the U.S. defeat. The Confederate forces were in some confusion because of Breckinridge's departure. Leadership was finally given to William E. "Grumble" Jones, and his forces rushed down the Valley to meet the U.S. forces. They met at a little village named Piedmont on June 5th. Calling on the Home Guard units, Jones force was still smaller than Hunter's, 5,000 to 8,500. The battle ended in Confederate defeat and death for General Jones, who was personally leading a charge into the left flank of the 34th Massachusetts. General Hunter moved for Staunton and captured it on the 6th. His forces wasted no time in burning Confederate stores, dismantling the Virginia Central Railroad, and taking whatever they didn't torch. On the 8th, General Crook arrived, making Hunter's combined force 18,000 men. Waiting for more supplies, and busy burning the Confederate holdings in Staunton, Hunter waited until the 10th to leave the town. His plan was to march south and assault Lynchburg. The Valley was again in confusion, as Jones was dead and much of his force incapacitated. Lee had no choice but to send in reinforcements from his own strained army at Cold Harbor. He ordered Breckinridge back to Lynchburg, and on June 13th, sent 8,000 men under Lieutenant General Jubal Early to the Valley. Hunter was proceeding towards Lynchburg, and entered Lexington along the way, burning VMI in the process. He reached Lynchburg on the 17th, his huge army facing only about 2,000 soldiers under General Breckinridge. Night fell, and Hunter planned to attack in the morning. The next day came, and Early's full force had not yet reached Lynchburg. Hunter got word of Early's arrival and overestimated the strength of Early's battered corps. Subsequently, Hunter withdrew to Staunton then headed west to the safety of the Kanawha Valley in West Virginia. The Confederacy was now in a rare position in 1864: the Valley was largely free of the United States forces. General Lee left General Early's next move up to the latter's own discretion. A gleaming prize lay precariously unmanned to the northeast: Washington D.C. While the bulk of U.S. Grant's forces were dealing with Lee's stubborn army, perhaps, just perhaps, Early could wreak havoc within the U.S. capital's walls. Therein lay the problem. The capital was surrounded by a formidable ring of defenses, easily one of, if not the most heavily fortified city in the western hemisphere. Though these defenses were there, there was only a relative handful of personnel manning its stations. Nearly all of Grant's Army of the Potomac was busily wearing down Lee's army to the south. Early, having Lee's permission, decided that he would move north, if not to conquer the city, then to force Grant to send a portion of his own force attacking Lee to defend Washington. Either way, the offense would aid Lee. A still more important factor in Early's decision had to do with the impending elections in the north. Though the U.S. forces were everywhere on Southern soil, the Northern will to fight was being doubted as Lincoln's reelection hopes were waning. Perhaps a new president would make peace and bring the northern boys back home. For Lincoln to be reelected, a major U.S. victory was needed and it hadn't happened yet. Early's invasion could do much to breed further distaste for the war in the north. Chasing Hunter down the Valley, Early arrived in Staunton on June 26 with his combined force of about 14,000 men. Along the way, Early's army visited Lexington and paid their respects to General Jackson. Early started north again on the 28th, reaching Winchester on the 2nd after a week of marching, brilliantly hidden behind the Blue Ridge Mountains. He first encountered resistance at Harpers Ferry on the 4th of July against U.S. troops under the command of Franz Sigel, the commander at New Market. Sidestepping this stronghold, Early continued for Washington, defeating a confused United States force on the 9th at the Monocacy river. Though he was the victor and had a straight shot to the capital, word was now spreading of Early's approach. Grant detoured two of his corps to meet this new threat. On the 11th, Early came to Washington, meeting rather feebly manned defenses. He sent skirmishers to test the defenses, but Grant's reinforcements had begun to arrive. On the 12th, the ramparts were fully manned and an assault by Early would have been very costly indeed. Early retreated across the Potomac and repulsed the pursuing forces at the Battle of Cool Spring on the 18th. The U.S. forces kept coming, however, and Early kept retreating south. The U.S. commander, Major General Horatio Wright was sure he had stifled the Confederates, and ordered Grant's two reinforcement corps back to join Grant's main army. Early now took the advantage of the overconfident Wright and soundly defeated the remaining U.S. force July 24th under General Crook at the Battle of Second Kernstown. Seeking revenge for General Hunter's pyromania in the Valley a month earlier, Early sent his cavalry under John McCausland to Chambersburg, Pennsylvania. His orders were to collect tribute or burn the city. When they failed to come up with the $100,000 in gold that McCausland demanded, they watched their city burn to the ground on the 30th. An obviously lofty ransom, Early probably knew there was no way that the citizens could come up with the money. Rather the general was seeking retribution for the travesties dealt Virginia at the hands of General Hunter. General U.S. Grant had had enough. He returned his two corps relieved by General Wright, and put General Philip Sheridan in command on August 7th. The Confederate threat was to be dealt with once and for all. After various reinforcements, including the two corps, Sheridan's army now numbered close to 50,000, a huge army. Grant wasn't going to settle for any more setbacks. Nevertheless, Early's forces slowed the progress of Sheridan's southerly moving army, rebuffing them on August 11th at Double Toll Gate. General Lee acted on this U.S. setback and sent General Fitzhugh Lee's cavalry from Petersburg to help Early's forces. These reinforcements were stopped in their tracks near Front Royal on the 16th by the U.S. Cavalry commander George Custer of Little Bighorn fame. General Sheridan was unsure of the size of Early's army, and ordered to avoid a defeat, made a defensive line south of Harpers Ferry and the Potomac. Early hoped to take Sheridan's entrenched men by surprise, moving to go around them and make another move for Maryland. He left a small force behind to prevent Sheridan from moving south. Unfortunately, Sheridan discovered Early's intentions and attacked Early's remaining undersized force. 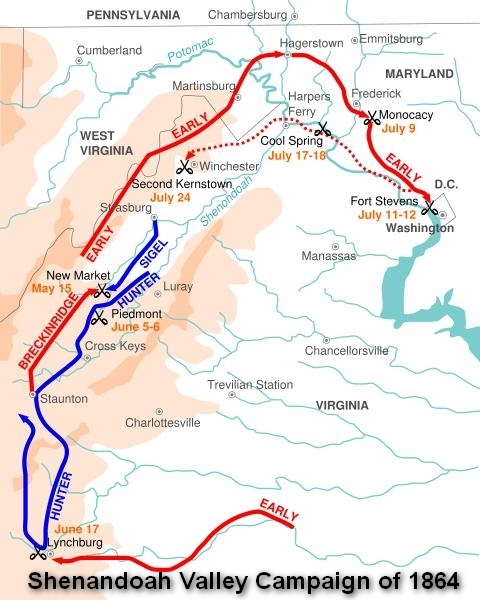 This forced Early to forego his northern move and rescue his beleaguered troops south of Harpers Ferry. The two armies now faced each other and engaged in a series of assaults and counter-assaults along the Opequon Creek in late August and early September. A breakthrough was finally achieved by the U.S. forces on the 19th at the Battle of Opequon. Unfortunately for Early, a part of his force was ordered back to Petersburg to help Lee. Sheridan took this opportunity to attack, and after a flanking maneuver on Early's northern line, broke the Confederates. Jubal Early fell back to Fisher's Hill. Sheridan's army used the thick forest cover to surprise the Confederates and thoroughly rout them on the 22nd. The C.S. forces fled all the way south to Rockfish Gap, east of Waynesboro. The Valley was basically open to Sheridan's whims. 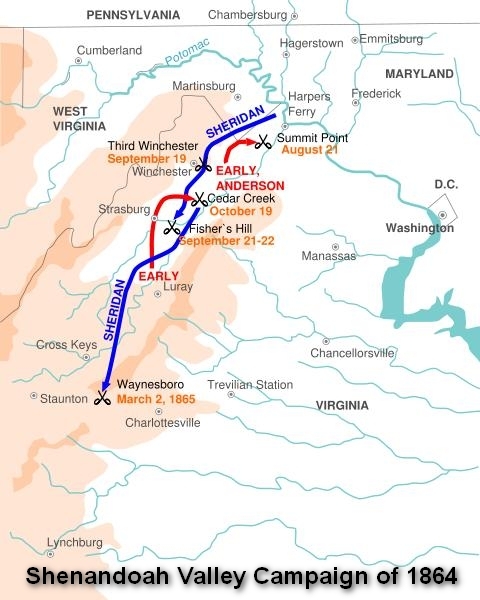 Sheridan burned at will, this time behind the full consent of General Grant, who wanted to rid himself of the Shenandoah threat once and for all. Lee reluctantly returned a part of his force to the Valley to reinforce Early at Rockfish Gap. The two forces met in a notable battle at Cedar Creek on the morning of the 19th. The Confederates had marched all night in order to surprise the sleeping Yankees. Surprise them they did, catching some in their tents, completely driving the U.S. forces from their camp. General Sheridan arrived from Winchester after the initial U.S. retreat and effected one of the most complete turnarounds of the war. He rallied his men and drove the Confederates from the field of battle. Early's army was now dreadfully outnumbered and further offensive actions were rebuffed at every point. The winter came and Early's men entered their camps, saved from perhaps total defeat by Mother Nature. On March 2nd, 1865, that defeat came at the Battle of Waynesboro. Early's small army was totally overwhelmed, and despite a valiant stand, the Confederacy lost this last battle for the Shenandoah in the course of a few hours. 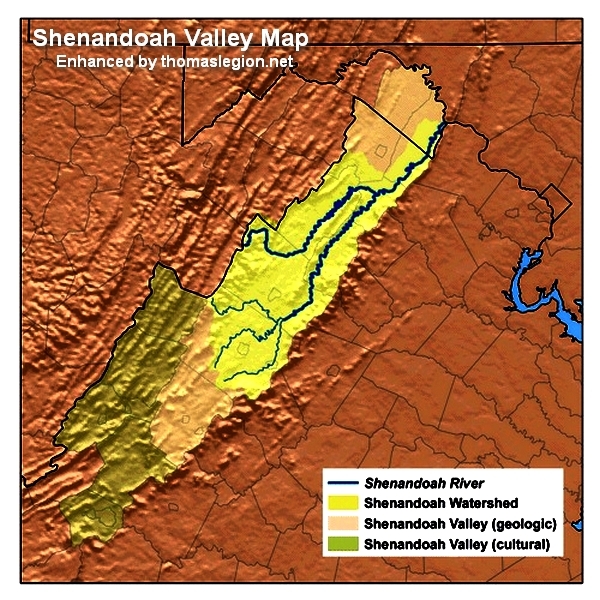 Sources: The Shenandoah in Flames, Valley Campaigns 1861-1865, The Shenandoah Valley in 1864; Maps by Hal Jespersen in Adobe Illustrator CS5. Graphic source file is available at www.cwmaps.com.